Hands-free & Voice-free Mouse Control with Your Smile! Smyle Mouse software for hands-free computer control. Hands-free Head Mouse Control via Webcam! Patented Head mouse & Face mouse software. Head mouse includes Smile clicker & Dwell clicker. No Stickers-on-face, 3D/infrared cameras, Adaptive switches, Wires, or Wearables required! Hands-free mouse control for disabilities such as Spinal cord injury, Multiple Sclerosis, ALS, Cerebral Palsy, Carpal Tunnel, etc. What type of disabilities does Smyle Mouse Head Mouse help with? 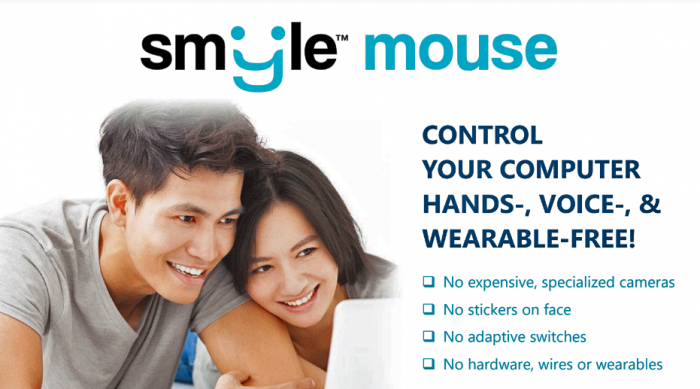 Smyle Mouse provides hands-free computer mouse control via gentle head motions and smiles. This can be very useful for people with disabilities or impairments related to use of hands, arms or fingers. This can include severe disabling conditions such as ALS, Spinal Cord Injury, Multiple Sclerosis, Stroke, Cerebral Palsy, Neuro-muscular diseases, and others, but also pain/discomfort in hands/arms due to Carpal Tunnel Syndrome and Arthritis. People looking for ergonomic computer mice can also use Smyle Mouse. What can be easier on your hands than not using them at all?! What are the system requirements to use the Smyle Mouse Head Mouse? Smyle Mouse head mouse software currently runs only on the Microsoft Windows operating system. It is designed to run on Windows 7 and above. Our head mouse has very modest hardware requirements. A webcam with a resolution of at least 480 X 240 is sufficient. We encourage you to use the front facing camera that is part of your laptop or tablet, but you can use an external webcam if you so choose. For best performance, we recommend a dual core CPU with speed of at least 1.5Ghz, 4GB RAM memory and 1/2 GB of free disk space. If you are not sure about your exact computer specifications, just go ahead and download the software, and take it for a spin! How does the Smyle Mouse Head Mouse work? Smyle Mouse head mouse provides hands-free and voice-free mouse control of computing devices. Using the Smyle Mouse, user can have complete mouse control over his/her computing device using simple facial gestures. These facial gestures can include gentle head motion and facial expressions such as smiling. Most interestingly, all these facial gestures are captured via a simple webcam. Along with movement of the mouse pointer by use of head motion, Smyle Mouse also provides clicking, scrolling and dragging actions, using patent pending gestures. Head mouse control can be activated by the act of smiling. For example, to move the cursor (using head motion), smile as you move your head. Once the cursor starts moving (which is instantaneous), it will keep on moving until you stop smiling and stop moving your head. To click, do a quick smile; that is, smile for a short duration. Having said that, out of the box, Smyle Mouse head mouse emulates traditional head mouses in that it does not require the user to smile to start mouse pointer motion. For more details, watch one of our short demo videos. Does the Smyle Mouse head mouse require calibration? The short answer is no, but we do recommend our quick 10-second calibration for best performance. Simply follow the simple instructions, such as hold your head steady for 2-3 seconds and smile for 2-3 seconds, and you are done! Can I try the Smyle Mouse for free? Absolutely! Just click the "Start Free Trial" button at the top of the page to download a free trial copy our next-gen head mouse and use it for 14 days. No credit card is required for trying out. Just download and install our head mouse software and start using it instantly. Can I really use the Smyle Mouse head mouse under a tree? Do I need to buy any special hardware for using Smyle Mouse head mouse? Can I use the Smyle Mouse head mouse on Android and iOS? 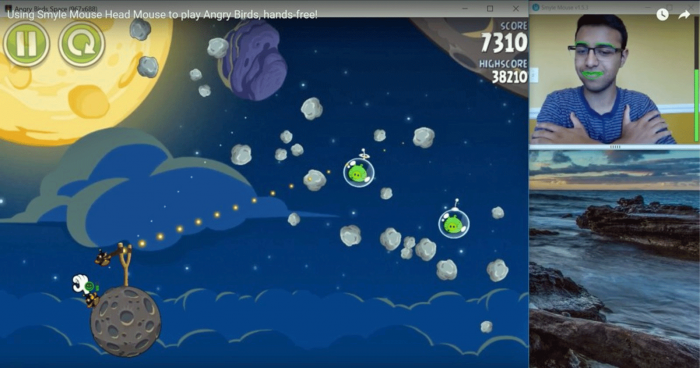 Currently Smyle Mouse runs only on Windows devices. We plan to release iOS and Android versions of our head mouse in the future. How does the Smyle Mouse license work? A Smyle Mouse software license authorizes a user to use it on one device. Once a user registers a device using a valid order number, the license is locked to that device and cannot be transferred to another device. What improvements does the latest Smyle Mouse release have? The latest version of Smyle Mouse head mouse (v1.8.7 released in October 2018) provides improvement in algorithms used for detecting user intention to click versus drag. 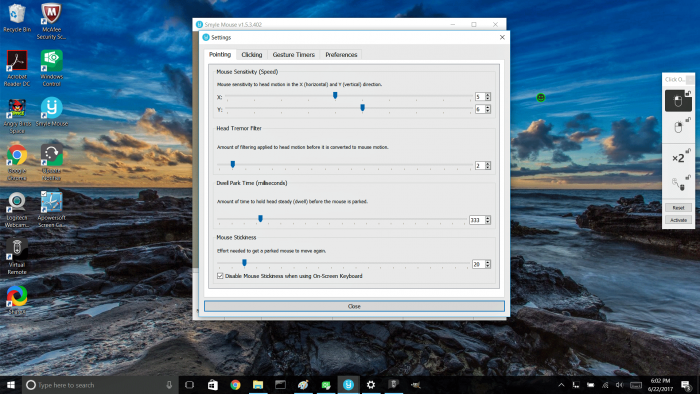 It also comes with improved default settings in order to make Smyle Mouse easier to learn for new users. The previous version of Smyle Mouse head mouse (v1.7.3 released in March 2018) provided Adaptive Switch Mode that allows using Smyle Mouse as an adaptive switch with AAC software. This can be useful for people with disabilities that cause excessive, uncontrolled body / head motions (such as with Cerebral Palsy) to use their smile as a switch input. 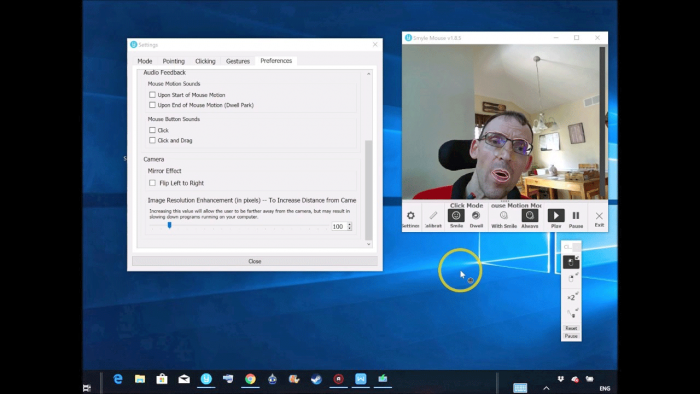 On the other extreme, it can also allow severely disabled people with very little ability to move their body / head (such as with ALS) to use their smile as a switch input. Go to Settings->Mode tab to make Smyle Mouse work as an adaptive switch. How do I know what version of Smyle Mouse I am running? And how do I get the latest version? When running the Smyle Mouse head mouse, simply look at the title of the main window to see the version. To get the latest version, go to the main page at https://smylemouse.com and click on the “Start Free Trial” button. When prompted, enter your email address and you will receive an email with a one-time use download link. Click on it to download the installer and run the installer. No other steps are necessary; your current license file will keep on working as before. What patents is Smyle Mouse head mouse based on? The technology in Smyle Mouse is based on US Patents 9,013,264 and 9,785,242. 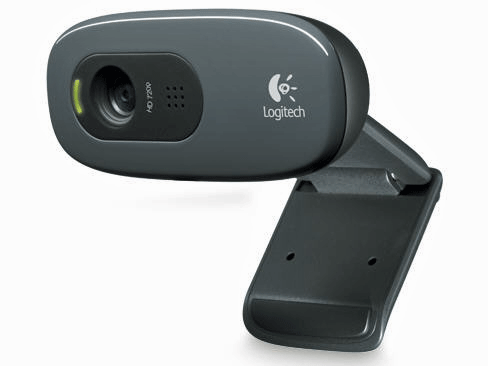 ** A webcam equivalent to or better than Logitech C270 is recommended.